From Markha (3700m ) To Hankar (3980m ) . 3 - 4 Hrs. From Hankar (3980m ) To Nimaling (4730m ), Via - Thochungtse (4200m ) . 5 - 6 Hrs. From Nimaling (4780m ) To Chuskirmo (4140m ), Via - Kongmaru La (5130m ) . 6 - 7 Hrs. From Chuskirmo (4140m ) To Leh (3500m ), Via - Shang Sumdo (3730m ) . 5 - 6 Hrs. The Markha Valley trek is one of the classic and best treks to be done in the Ladakh Himalayas. It a part of the ancient Silk Route and belonged to the region of the ancient Indus Valley Civilization which can also be considered to be the roots of India. 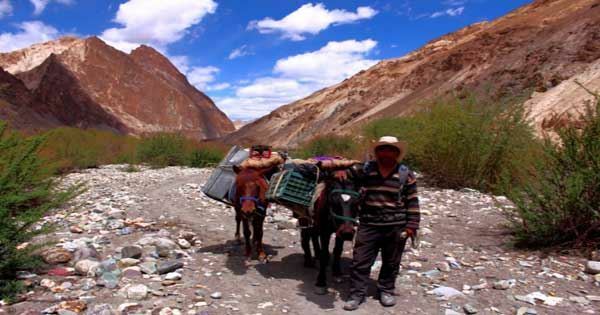 The Markha Valley trek is very popular trek amongst the foreign trekkers visiting Ladakh but is very less done by the domestic trekkers in India. This trek is a charm in itself and takes you deep into the wilderness. It is a complete trek and gives you the actual feel of a local in Ladakh. Some of the very old monasteries can be seen in this route. The trek passes by the villages of Skiu, Hankar and Markha which is perhaps one of the most fertile areas of the cold desert. The contrast of the greens in the creamy background of the mountains of Ladakh surprises you initially, but after you learn and see the amount of dedication, hard work and care the villagers devote to make the land greener wins your heart. This entirely adds a new dimension to the trek and has a great impact in your perception of the local dwellers. You get a feeling that even after the life of a city dweller being full of comforts and easy, they are still unhappy and complicated. Whereas here you see these hard working people welcoming you with the widest of the smiles... Well its just the beginning and we are yet to enter deep into the wilderness of the Markha valley. As you approach Hankar, the mighty peak of Kang Yatse starts to dominate the view and the peak is such a beauty that you cannot stop gazing at it like a love at first sight !! Further into the trek from Hankar, we proceed deeper into the valley towards Thochungtse and the high pasture land of Nimaling. Thochungtse is one beautiful campsite and here you have high chances of sighting the rare fauna of the Hemis National Park. Often trekkers get lucky to get a rare sight of the most elusive Snow Leopard. Blue Sheep and Ibex are very likely to be seen. So is the red fox. Well, the trek does not just end here. There is more to come. The trek now further takes you to the high pass of Kongmaru La which goes as high as 5315 meters offering grand views of the surrounding peaks and of the East Karakoram. The descend from Kongmaru La exits via one of the very beautiful valley with unbelievable views trekking straight down the Markha gorge and reaches back civilization in a small settlements beside the Markha river and ends in Shang Sumdo. Ladakh is all set to inspire a magic into your life !! Come, lets feel the Himalayan High thats present in the Markha Valley Trek. We believe that a smaller group gives you the best of the Himalayan Experience and specialize in organizing customized groups for the Markha Valley Trek . Do get in touch with us if you want us to arrange this trek for you. You can use the link - Customized Plan For Markha Valley Trek to drop us an email with your specific requirements and service required. We will get back to you with the detailed plan and quotation as per the group size and service requested. The magical landscape of Ladakh: If you have not witnessed the magic which the mountains of Ladakh does to your heart, you have lost so many things in life. Sensing the ancient Indus Valley Civilization: Do you remember the Silk Route - the ancient trade route and Indus River Civilization from our history books in our schools ??? Walk on a part of the ancient route and the place on this trek !! Ancient Buddhist Monasteries and Culture: There is a reason why people call it 'Little Tibet'. It is said the raw and ancient typical practices of the Tibetan Buddhism can now be found in India ( Ladakh and Sikkim ) and not in Tibet. River crossings: Its very exciting to cross a Himalayan river, and on this trek you do that several times. Sometimes you need to take precautions and extra care though!! People of Ladakh, their culture and way of life. 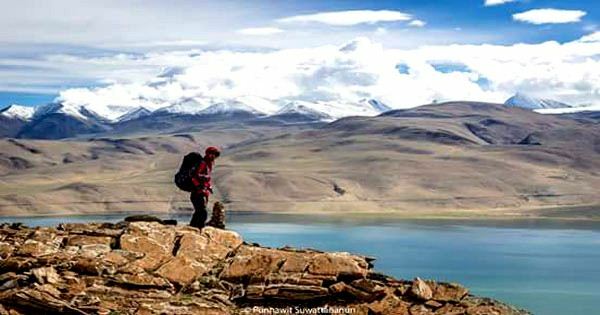 This trek give you a lot of options to interact with the locals and know their way of life which does not fail to inspire you from multiple dimensions. The trek to Hankar from Markha is a short one, and we have kept it so to enable you to spend some good time in this prosperous valley of Greens with snow covered peak of Kang Yaste hovering over it from the top. Aftre spending a peaceful night in the village of Hankar, today we will head to the hjigh altitude pasture land of Nimaling. The terrain changes immediately after crossing Hankar with no mentionable greens to be seen further. The route is jaw-dropping with unique structures of the mountains and the rocks. Here its very easy to spot blue sheep and ibex, snow leopards too !! A walk of some 2 - 3 hours brings us to a small grassy plains which is the designated campsite of Thochungtse. After taking some rest here, we head towards Nimaling. After crossing Thochungtse, we climb a mountain hump straight ahead of us. At that altitude, it does take some time, but once done, enjoy up-close views of Kang Yatse. A huge massif, overwhelming us with its presence. We reach a small lake where we rest and watch the reflection of Kang Yatse on the water surface. Its from here, the route splits and one goes to Kang Yatse base camp and the other one descends to Nimaling - a vast platue encircled by tall mountains all over. A rest day on this wonderful land. We use it to the fullest by exploring it deeper. We have the option to go till Kang Yatse Glacier, climb up the nearby un-named peak, etc. One of the most beautiful day of the trek. This is the beauty of the Markha Valley Trek - 6 days into the trek, and its still does not stop getting beautiful and imposing. Today we negotiate the Kongmaru La (Gongmaru La) – 5130m, a high pass with wonderful views all round. Climbing through multiple switch backs takes us to the summit of Kongmaru La in an hour or a little more, marked with lots of prayer flags furling with the wind. Spend some good time here to relish the views all round. Continuing to the descend we started yesterday, we trek down sharply to Shang Sumdo. Once we reach, our cab will be waiting to take us to Leh. With that, a beautiful trek comes to an end. My husband and I are very impressed with the experience we had at Markha Valley. This is our first time trekking overnight and we were unsure what to expect. The team at Himalayan High were professional in providing us information on what to expect when we arrive in Ladakh and how to prepare ourselves for the trip. During the trip, our guide, cook and horsemen was attentive and professional. Overall, we had an amazing time!